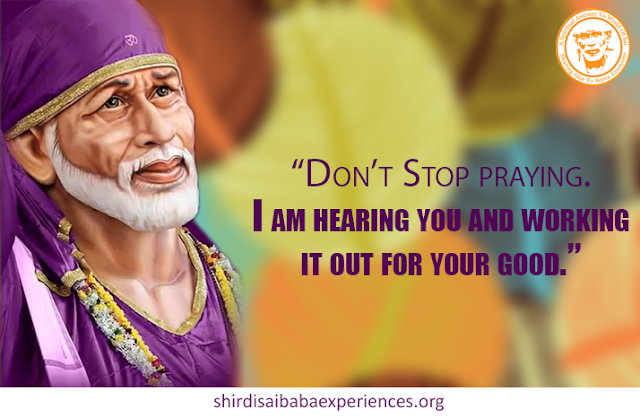 “Don’t stop praying I am working it out for you” was one of the Sai picture messages that I had stumbled upon once and it left me thinking quite a while. I began to think what must be Baba doing to work it out for us? To reduce the intensity of our karmas or to burn our sins does He have to do any meditation or naam jaap or something else on our behalf? I know I may sound very foolish but I somehow wanted to know or do something to help Baba Who is always ever so responsive to help His every devotees’ every sincere call! Also none can equal His love and care for all His children for whom this Universe is His home and all the creation as His children. I know we are not even a small dot in this gigantic Universe created by the Lord and it was so funny of me to think of helping the Almighty. But believe me I was desperate to do something for Baba or it was Baba Who was inspiring those thoughts with a flash of Lesson For Life – The Universal Prayer, I still don’t understand how to frame the words exactly? Lesson For Life – The Universal Prayer these six words along with the hyphen since then have always been there in front of my eyes but still I have always ignored them giving priority to other spiritual ventures inspired by Baba thinking it(LFL-TUP) to be unrealistic or not logical to even think of helping Baba Who is Himself the God. Now that all the things which were in mind (MahaParayan, 365 Days Parayan, Vishnu Sahastranamavali Parayan, Stavan Manjari Parayan, Anant Akhand Sai Mahajaap, Brahma Muhurat Parayan, Hanuman Chalisa - The Longest Garland and the meditation group) have already started executing smoothly, my attention was again drawn to Lesson For Life – The Universal Prayer. At the very beginning itself I myself also had felt very foolish about the idea to help God but immediately I was then reminded the story of Squirrel from Ramayan. Still I ignored the thoughts and thought of first serving Baba with different spiritual ventures stated above as this was slightly on different lines. What is Lesson For Life – The Universal Prayer? As I mentioned that picture had left me thinking how to help Baba and was it logical to think so? Lesson For Life –The Universal Prayer is an attempt to help Baba as He has so many uncountable children for whom He needs to work out so many things continuously. So we would be attempting to offer help to Baba and it would be Baba’s wish for whom to use those prayers for that day. I know to some it may sound foolish or funny to think of helping God and also because we would never ever know for whom, where and how our prayers were utilized unless Baba Himself tells us! Here every devotee would select a chapter from Sai Satcharitra which he or she would read it everyday for Baba and would not expect anything in return for themselves or their known ones. As at every moment in the world someone is in desperate need of a prayer or Baba’s help, we would say Baba that, “Baba I would like You to consider my reading of this chapter as a prayer for someone whom You feel needs it the most in any aspect and that You only know it the best”. Although God is having thousands of hands to help His uncountable children still He has to work out something as He says. So what could be better if our reading a chapter from Satcharitra in form of prayer can be of any use to God? So whatever chapter we choose would be our lesson for lifetime and read it everyday without fail which would be the prayer offered for any aspect like health, pregnancy, job, family, education, wealth or any desires or needs of Baba’s children/beings in the whole of Universe! I am sure anything offered with love is surely accepted and this can be very much related with the story of squirrel (Reference - Read Full Version of Story) from Ramayana where it had helped Rama in building the ten yojana long bridge to Lanka. The squirrel would jump in the sea water, wet it’s body, roll over the sand, carry some pebbles in its mouth and then shed the sand and pebbles over the bridge. Although there were thousands of monkeys who were involved here scolded the tiny squirrel for coming in between but Rama seeing her love and bhakti appreciated her efforts which helped in plugging many holes in the bridge that could not have been possible with huge stones by monkeys. Rama then warmly stroked the back of the squirrel with his fingers and since then, it is believed that squirrels have three lines on their body as Rama had moved His fingers over their back. Now that Guru Pournima was approaching I was telling Baba to give some signal to proceed further with this concept of Universal Prayer. He did give many many signals but not exactly the way I wanted like in dreams straight orders like MahaParayan etc. Some really beautiful leelas did take place as a clear signal to move ahead like one of those being where I was discussing with Kritiji (the Creative Designer for the beautiful picture messages) about this concept, logo and some creatives that were needed; I continuously happened to see a squirrel outside which is not very usual for me and on top of it I was again reminded of the story and shared with Kritiji which she was not aware of. She was very happy to hear it and decided to use it in upcoming creatives for it. Not only this when I shared with Hetalji she too liked it but was not aware of it. So I began to doubt that whether such story really exist or it was my imagination? As I too have read Ramayan many times but have never come across this story in it. So doubting my human mind I googled about its existence and to my relief and happiness I did find it exactly I had known about it may be during school times. I still don't know and not sure who told me the story and also its relevance that was made to me. This again showed that Baba is only behind everything and we are just the lucky chosen small instruments. A lot more beautiful leelas were there but due to shortage of time would later share the leelas about how this LFL-TUP took shape. I am sure Baba will soon bless us with the most beautiful post to share about it. Another beauty of this Lesson For Life – The Universal Prayer is that there would be separate whatsapp group formed for each of the chapters and each group would have 108 members over the period of time as we would begin from this Guru Pournima itself that is 27th July, 2108. Once when all groups would get full; everyday 108 parayans of complete Sai Satcharitra would be offered to Baba unlike in Mahaparayan where it happens at the end of one year. But here it would be as a help to Baba to work out things for His devotees/beings whom we do not even know. This would be a 100 percent selfless act with 0 expectations in return from Baba. We would never even come to know for whom our prayers were utilised? Baba Himself will choose and guide His children. We would also pray that we do not want any kind of fruits in return. The law of Universe say: YOU GET BACK WHAT YOU GIVE AND THAT TOO MANY FOLDS! If we plant few seeds of apple we get a tree with many, many apples and many more seeds in return than what we sow. Similarly if you do good it will somehow someday come back to you multiplied and if bad then bad karma will multiply and it will make sure to reach its correct address. Karma never forgets its right address! So we never know that some day when we or our loved ones would be in desperate need of some prayers and that time may be these prayers may come back to us too. I know all of us are already having many other commitments one may feel difficult to think of enrolling or reading devotedly. But believe me I myself have started reading Chapter 36 daily for Baba past 2 to 3 months nearly and now it hardly takes me 6 to 7 minutes. Its not that we do not have even 10 minutes to waste everyday then why not invest in good karmas? Above all Baba is within us and He Himself is getting everything done. When we will try to spread light automatically the darkness from our lives too will disappear. The squirrel is such a small animal. It could not have been of any great use to a very tough mission like building a bridge across the ocean all the way to Lanka. Yet, it came up to the place and with full application of mind, heart and soul did what it could. So insignificant in terms of magnitude, but in terms of dedication and devotion to the cause, an unparalleled example. 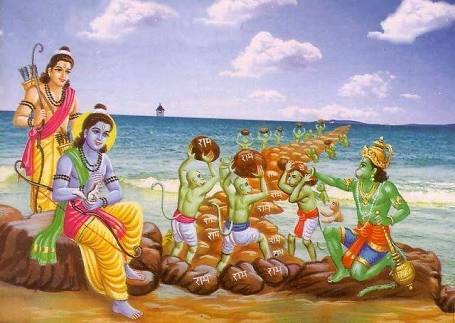 Rama recognized its services and blessed the species! It conveys us that To God no service is small or insignificant. 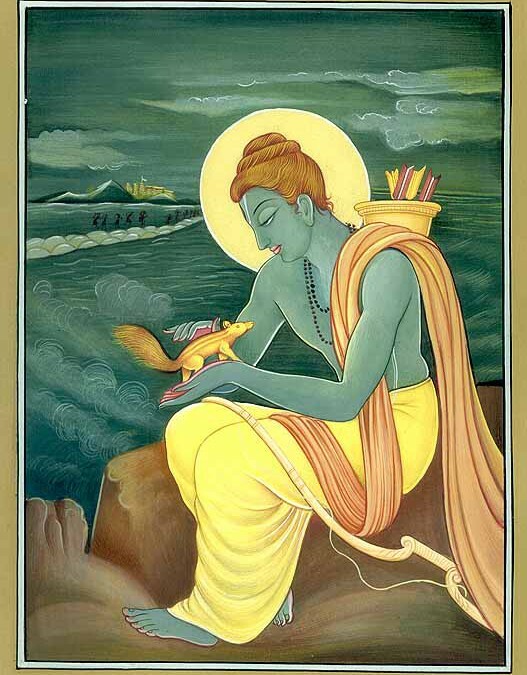 In Ramayana, a tiny squirrel helped Lord Sri Rama build the bridge to Lanka. Seeing its devout service, Sri Rama affectionately patted on its back. How many of us would be lucky enough to be affectionately touched by the Lord Himself? Size and power really doesn’t matter when it comes to Bhakti and thus thinking to help the Almighty! What all needed is the love to do something to help our Baba in our own little way just like the little squirrel dared to make an attempt to help Sri Rama! So let's attempt to be the little squirrel to our Sai Rama and get ready to feel His warm pat on our back...! We have 48 links for different chapters and one group for those who would like to take the responsibility for volunteering a particular chapter group. Please click the temporary link group and enrol. You would soon be moved to the main group. We need 1 teacher and 108 devotees for each chapter group. So please come forward to make it happen! Please remember that let not all choose only ch 11 or ch 15. Choose any chapter which you have a special connection to or the one which you like the most. 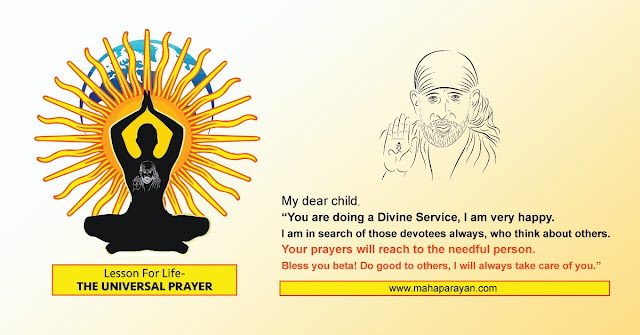 You may also randomly open Sai Satcharitra and select the chapter which Baba directs You too. As we need to fill in all the groups so that gradually 108 parayans can be offered everyday and this would be possible when all the chapter groups are filled. Please note one has to read the same chapter everyday and report in the group as Name, Roll no and chapter no read as per IST. The volunteer will make a count of your offering and next day report it further if received before 12.00 midnight IST. So all would have a 24 hour window for reporting. It would be lifetime as the name suggests for any aspect, for anyone and anything in the Universe and about whom we do not know. It would begin from 27th July (IST) Guru Pournima. You can listen to the audio of the chapter available on our blogs. If someday you are not able to read, you can ask your friend or family member to read on your behalf. But please manage it on your personal level and not ask in group possibly. Some languages (Gujarati, Kannada and Marathi) of Sai Satcharitra have 53 chapters. We would be referring those chapters as per Hindi or English Sai Satcharitra as 1 to 51. You can select or match up the contents and read accordingly. Some of you already may have prayer groups where if the admin wishes can convert it into a group for a particular chapter number group and thus make it a part of Universal Prayer for every being about whom Baba knows the best. Om Sai Ram. Thank you, I have joined. Instead of choosing myself, I asked Baba to choose which chapter he wanted me to read. Here is how-I went on to a random number generator website and prayed to Baba to guide the result, I asked for a number between 1 and 51 and joined the group whose number came up. If others try this, it may help to ensure a good distribution amongst the chapters. May Baba bless this venture. Please help..I am unable to join the groups as all links hv been revoked.I am new devotee of Baba.I want to be a part of this service fr my lifetime.Please reply how to join the group.